This is a beautiful cat, and we love it. We love it very much. That cat is eating and has paws that seem very large in comparison to its tiny kitten size. We like both of those things, and also everything else about this cat. Why are you making this cat sad? Please play with this cat. If you did not sigh, even one bit, you have a heart made of stone. Same caption as last caption. Also same caption as two captions ago. A tiny, perfect, furry cat with a serious expression. We hope someone petted this cat very gently and gave it treats and also played with it. This cat might not be totally convinced by the whole business. We will watch you sleep until our hearts explode. Humans are peculiar and should be watched closely in case they suddenly drop some tuna. The only thing as wonderful as a kitten is a cat of any other age. Older cats are glorious, too, and should be adopted and admired and loved and well fed. WHAT: A pop-up cat café brought to you by the people behind Pet Me Meow. The event ran only from June 6 to June 8, but if you missed it and blame yourself very much for having missed it, you’ll have the opportunity to “play games, listen to music, enjoy a latte, and most importantly, play with cats” in public again soon, because entrepreneurs Ashkan Rahimi and Jeff Ro plan to open their permanent and “epic” cat café by fall 2014. 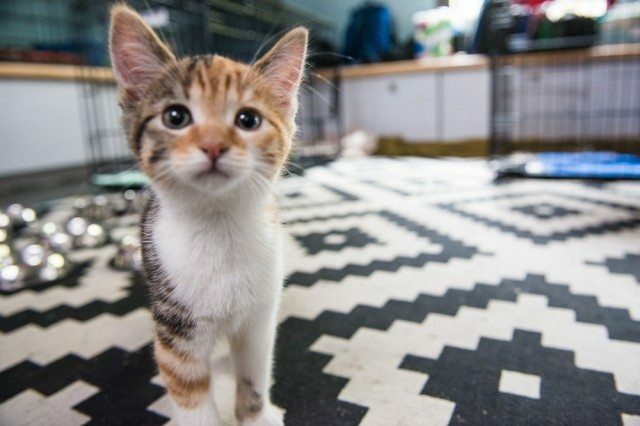 If, while playing games, listening to music, and enjoying a latte, you discover you never want to part from your new cat friend ever again, you’ll be able to make it a permanent part of your life by taking it home: Pet Me Meow’s felines are available for adoption through Toronto Cat Rescue. And we have it on good authority that as of noon yesterday, six of the 10 cats participating in the pop-up event had already been spoken for.